Does your new V8 supercar sound like a 4 cylinder??? WE CAN FIX IT !!! Ninety Percent of the cheap power gains will be obtained by fitting a good set of extractors, Ballistic 100cpsi Racing Cats, performance exhaust system, cold air intake, and a MAF or MAFless tune. On the VE - VF we did our testing on an Auto Sportswagon with AFM and we found the dual 3” system gave the best power gains and we made a completely straight through system, that doesn’t drone, and we made a system that is under the 90db noise limit. 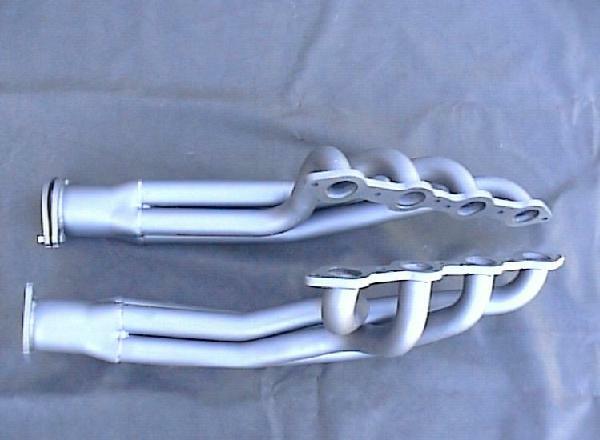 Check out the VE - VF Exhaust page for further details. The standard cats are 400cpsi on the VT – VZ models and on the VE – VF the cats are around 600cpsi. CPSI means cells per square inch, therefore the bigger the number, the smaller the internal holes are. The 400cpsi holes are so small a pin barely fits through, so you can imagine how small the holes in the 600cpsi cats are. When we did our testing we found that changing from a 400cpsi cat to a Ballistic 100cpsi Racing cat on a VT – VX Commodore increased power by 10rwkw – 12rwkw, so it was a substantial gain in power, which also translates to better fuel economy. Check out the Ballistic 100cpsi Racing Cat page for more details. The MAF is the “Mass Air Flow meter” which is located in the tube from the air box to the throttle body. On the VT – VY the MAF was quite small and restrictive, whereas on the VZ and newer models it is much freer flowing and doesn’t restrict performance like the earlier versions. The HSV GTS did not use a MAF, and instead relied solely on MAP (Manifold Absolute Pressure) to run and tune the engine. So when someone says a MAFless tune, it means that the MAF has been removed and a GTS tune has been flashed into the computer and the engine has been tuned to suit all of the modifications that have been made to the car. Rather than using a piggy back chip, or an aftermarket computer, programs such as HP Tuners and EFI Live allow tuners to access the computer program and modify it so your car runs at its optimum tune, and in most cases, it develops more power while using less fuel. The tune can recalibrate your speedo after wheel or diff changes, it can fix sluggish shifting problems in the auto, it can change the speed and rpm at which gear changes are made, etc. Refer to the Custom Tuning Page for more details.